Front and back of a signed prayer card, asking for all the information he would later 'discern'. Some followers of William Branham admit that their "prophet" did make mistakes, but these were all minor. They also state that we must avoid examining those mistakes but simply look at when he was under the "anointing" when the "Angel" was standing beside him. Some of his followers, having been exposed to several critical flaws in the fundamental teachings of William Branham, even acknowledge that the sermons themselves contain several errors, but the prayer lines were "God's voice to us." You are currently on the page that is in bold. This article asks the question: Was William Branham's discernment infallible or were there errors? 1 If there were errors, what caused them? 3 If there are no errors, why are there so many blank spots on the tapes? If there were errors, what caused them? And now, I want that lady here, just to stand right here by the microphone. I know the lady. I--I think her name is Sutton; I'm not mistake... [The sister says, "No. Cobb, now."--Ed.] Oh, Cobb, I'm sorry. I've seen the woman before, so she comes here to the Tabernacle once in a while. And now... But I know nothing of what's wrong with her. But now, the only way that I would have of knowing that, would be some way that God would have telling me. Isn't that right, Mrs... Cobb? All right. Cobb, would be, is your name now? All right. All right, Mrs. Cobb, the only way that I'd know that what was wrong with you, would be God would have to reveal it to me. Now, just with your heads bowed just a moment. How long have you been that way? Hear me now? Can you... Amen. Two years...?... You hear? Yes. Amen. He can hear now. Let's say, "Praise the Lord." God bless you now. Go on your road rejoicing and be happy. Amen. Let me see him just a moment. I thought it was your hearing. Can you...?... It was his hearing and his speech. Say, "I" [I] "Love" [Live] "Love," [Love] "Jesus," [Jesus.] Sure you can say it. Say, "Thank You." [Thank you.] All right. It's over now. You can go on rejoicing. All right. Do you believe with all your heart? You believe? If thou canst believe, all things are possible. You're from out-of-town too, but do you believe? You're scared, aren't you. You are to be mother, and the reason you're scared, you got a rupture; and you are afraid of this baby whether it'll be right or not. Only if you won't doubt, Mrs. Hoffman--Huffler, then you can believe--healed. You believe it? How does He know your name and know who you are? Do you believe it with all your heart? All right, Mrs. Huffler, you can go home and bring forth the baby in peace. Say, will you do me a favor, sister, that God done you one? We're strangers, aren't we? Lay your hand on that woman behind you, call her Mrs. McAlister. She don't know me. McAllen, rather. She's got trouble with her head. But it's going to leave her, and she's going to be all right. She don't hear too well. All right. It's all over now, Mrs. McAllen, you can go home too. You believe Jesus Christ now makes you well. All right. Then go home, be made well. What about in this section, somewhere in here? Have faith. There is a man standing before me, he's had a operation for hemorrhoids; didn't do any good. Mr. Day, I beg your pardon, Mr. Short, stand up and receive your healing. With my Bible before me, I never seen the man in my life, we're total strangers one to the other. What do you think? You're up for an operation, too. You're a stranger to me. Is that right? [The sister says, "Yes."--Ed.] You're not from here. ["I know you, but you don't know me."] You know me, but I don't know you. ["You don't know me."] But God knows you. You believe that? ["Yes, I do."] You're up for an operation. You don't live here. You're near Bedford, Springville, something like... That's where it's at, Springville. Mrs. Burton... No, no, I beg your pardon, I didn't mean that. Mrs. Parker, that's your name. Isn't it? Greater is He that's in you, than he that's trying to kill you. Is that right? Do you believe with all your heart? Then you won't need your operation, if you do. Here is a lady right out here in front of me. And she is very sick, perhaps sicker than what she thinks she had. She is actually suffering with hemorrhoids, and they're becoming cancerous. Mrs. Morgan... not Mrs. Morgan, I'm sorry. It's Mrs. Anderson. If you'll believe with all your heart, Jesus Christ will make you well. Do you believe that, lady? Stand up on your feet, if that's right. I don't know the lady. She is exactly in line with this other lady, and I could see that still hanging there. That's the reason. The other night... You may sit down, if you wish to, sister. And believe, and you'll be made well. Now, when He come to Simon, He told him who he was. You believe God can tell me what your name is? Would it make you believe more? It would? Mrs. Strong... [The sister says, "Stout."--Ed.] Stout, would you believe? Go and believe, and you... It's all over. Amen. 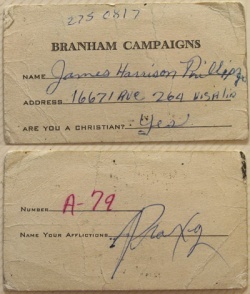 Why did William Branham require people to fill out prayer cards before he prayed for them? And why were people required to line up in numerical order in the prayer line? You believe the Lord? You people with your prayer cards now, Z 1 to 50, line up here, numerical order, 1, 2, 3, 4, 5, and on like that. When you're praying for the sick and talking to them, more you pray, more you talk to the person, the more you know of them. I'm going to have my minister brothers, if they will, to stand right back here behind me just a moment. The reason that I said someone without a prayer card, some of them think, you know, that looking at the prayer card that the person thinking about what, it'll be mental telepathy. But it is not. It is--I take those who don't have prayer cards. That doesn't matter. Anybody in the audience, wouldn't make a bit of difference; you know that. The people come here and told of things they done when they were little children, and so forth. Isn't that right? And that's not mental telepathy, anyone. It's the power of Almighty God. Now, if you don't believe it, it'll never do you any good. But if you do believe it, it's healing for you. Everybody be reverent. Now, bring those with prayer cards Z-1 to Z-50. And let them line up in numerical order, right along here: Z-1, Z-50. And then immediately after that, when those go through, we're going to line up all that wants to be prayed for in that aisle, then all that wants to be prayed for in this aisle, then all that want to be prayed for in this aisle, and all that wants to be prayed for over there. And bring them right around, and pray for everybody tonight. You believe we can do it? Are you going to accept it as your healing? Now--now, just let those stand up first who have prayer cards. Let the first fifteen, from D-1 to D-15... You people setting near them that's got cards, they may be deaf. You look at their cards and examine it, 'cause they wouldn't be able to hear me. And line up here according to your number in numerical order. 1, 2, 3, 4, 5, 6 up in... D-10, or D-15 rather. D-1 to D-15. We'll begin with them to start and just pray for as many as we possibly can. How many cards did you give? All right. Start right from this, just line up the line. He give F from 51. Get start it right here, 51, 52, 53, 54, 55, just as many as you can crowd in there, I guess. Let it get up to about... Well, you can get... Can you get more than ten in there? All right, try the first ten, and then maybe we can get some more after that. 51 to 60, that's six... 51 to 60. And then as soon as that crowd gets down, as soon as they level down, if there's more room, step right up. Just start 61, 62, 63, 64, 65, up to 70. That crowd gets down, start right on to 80, like that. And then when that gets... By that time, every one of you ought to be in the right position, the Holy Ghost falling over this building for every one of you to be healed. What was that 50 to 60, I... 60, 60? 60 to 70, D-60 to 70. Come down in this way if you will as you're come out. The line's forming this a way and so it's... 60 to 70. The ushers will place you just in your position. We never know... The reason we do that, we never know where, what's going to happen. You see? The Holy Spirit might do something (You see? ), and He might stop the line at a second. He might... We've had much experience in eight years. 70 to 80, D-70 to 80. That's good. Come this way, everybody. Line up this way with your--your cards in this way. 70 to 80, 80 to 90, 80 to 90. Uh-huh. All right. Now, from 50 to 100 in B's, let them go right back in the back, and start going back that way, and taking your place. Now, if anyone here's got one of those prayer cards that's crippled and can't walk, well let them just be brought right up here and I'll--I'll come down and pray for them. Now, let's us who are waiting now, let's just bow our heads. And the organist, if you will give us a little chord of that "Only Believe," will you? Every one real reverent now as we're making the lines ready, and making everything just in order as we possibly can to make it easy for each person to get into the line. Each person will have their place and position. What was that 22? 23, 23, prayer card 23, 24, 25, 26? Good. 27, 28, 28, 29, 29, 29, 30? Thank you. 31, 32, 33, 33? I didn't see it. 34, 34, 35, 36, 36, 37, 37? I didn't get it. 37, 37? Look around at your neighbor. He might have a prayer card. 37? He might be deaf, might be able... can't get up. See? He's paralyzed, and can't move. 37? Somebody must've got it and went out. If they come in, put them in the line, position them in their place now. The ushers will be there to help. 37, 38, 39, 40, 41, 42, 43, 43, 44, 45, 46, 47, 47? That's good. 48, 49, 50, 50, the man back there. Now, is all the people that has prayer cards up? Has anybody else got a prayer card? All prayer cards standing in the row? I want to be sure of this now. We called one, 37. I seen a couple of brethren come in since then. I just wonder. I've called prayer card 37, and it didn't answer. That's the only one that I seen myself that didn't answer. Prayer card number 5? Did it answer? Brother Vayle said he didn't notice prayer card number 5. Number 5, is it there, and 37? Now, if you will just give us a moment or two, friends. Now, we'll... Someone coming in again with a baby. Maybe it might be some of the women and brothers has to step out with their little ones. And--and if they're out now and that number comes in, put them right in line, right in their place, put them where 37 and 5 belongs. And that makes everything just right then. 37 and 5. Everybody now be alert, be ready, be willing. The prayer cards in this section, come over here and stand now. The prayer cards over in that booth, come over and stand. And as soon as that line goes down, let this side come, and that. Then let the balcony come down next. And now, everybody now, while they get in their position and place, let's... And then, if we have time left, the rest of them come. If there are no errors, why are there so many blank spots on the tapes? We have heard that “It’s never failed one single time.” And outside of a few people out of order in the prayer lines, foreign names Branham struggled to pronounce when under the “anointing,” and the lady who corrected Branham during the prayer line, this would appear to have some validity when you listen to the recordings. But have you ever stopped to consider how differently a prayer line might seem if you heard the unedited versions? Friends, you'll have to keep your head bowed. As I raised my head, at least two dozen cold waves of vibration struck across me [Blank.spot.on.tape--Ed.]. All right, brother. I'm... After speaking, makes me just a little shook up, you know, I get... I guess that's humanly nervous, you know, just it's... It just happens that way, I guess. But, anyhow, I've got to get myself quietened down to the anointing of that Angel of the Lord. [Blank.spot.on.tape--Ed.] Two? There's nothing I can do. What cards was give out? [Blank.spot.on.tape--Ed.]... here for your first time? Who has G-number-1, raise up your hand. [Blank.spot.on.tape--Ed.] And don't doubt, and you'll see the glory of God, if you can believe. But you must believe. Your healing is already purchased. Healing is a finished work. I have no healing in my hand. I have... [Blank.spot.on.tape--Ed.] You must be mistaken, brother. Now, there's a change in my ministry coming. And how many... Would there be one here that remembers when I first started on the field? Let's see your hand. Oh, my, there's several. You remember how it was given to me by the Angel of the Lord, that I would take my left hand and lay it onto the--the person was standing sick, and not use my own voice, and It would speak out and tell them what was wrong with them? You remember that? And you remember, I told you that the Holy Spirit told me that night when I talked to Him, what it would be. And said, "Then if you'll be sincere, it'll come to a place that you'll know the very secret of their heart." How many of you that was in my first meetings heard me tell that before that ever come to pass, raise up your hands high. That's good. Now, has it come to pass? Then He said, "If you'll continue to be sincere and humble, it'll grow greater and greater." And now, this ministry is going to step higher now, into another realm, where it'll be far beyond what it is now. I don't know just what it is, but I'm warned of the Holy Spirit to quickly now, close my meetings off (My last one will be in Philadelphia), and go into the hills and wait on the Lord to see which a way to conduct this ministry. When I come out again, it'll be in a new ministry. This ministry will never cease; this ministry will continue on. This first will continue on; it's still just the same. This page was last edited on 14 May 2017, at 15:13.